Attending a tango show in Buenos Aires is a quintessential experience, but few tourists get chance to discover the city’s real tango scene. Explore the atmospheric birthplace of the tango on this 6-hour tour of the San Telmo neighbourhood, tuck into a traditional Argentina ‘parilla’, then join a tango class at an authentic local ‘milonga’. Meet your guide and tour group by the Mafalda statue in the heart of San Telmo and set off to explore the city’s oldest district. As you stroll the cobbled streets of San Telmo, hear why the neighborhood is dubbed the ‘birthplace of the tango’ and remains the heart of Buenos Aires’ tango scene. 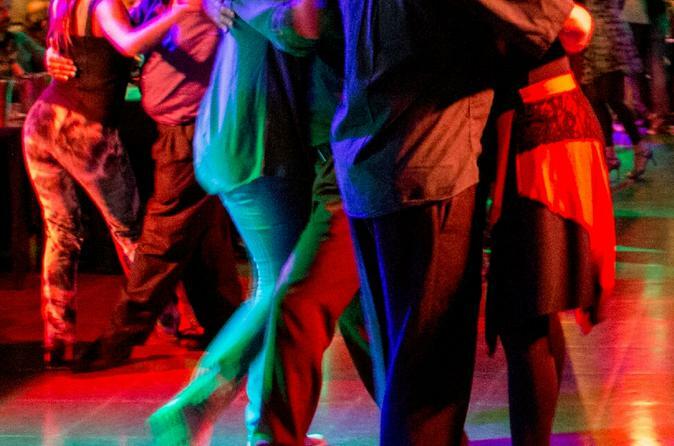 Then, get your first taste of the tango, as you attend a traditional milonga (tango club), and watch local tango dancers take to the dance floor as a live band plays. After leaving the milonga, head to a nearby parilla (grillhouse) to feast on a platter of delicious grilled meats (vegetarian option also available). With your appetite sated, it’s time to take to the dance floor at another milonga, this time for a tango class led by professional dance instructors. First, be memorised as your instructors show off their spectacular tango skills, then learn some basic dance moves with the local students and spend the rest of the evening practicing them on the dance floor.